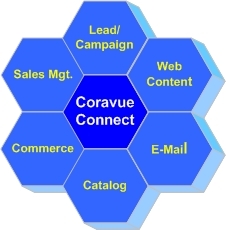 completely integrated marketing and sales system. The Coravue® hosted CRM system helps mid-market companies create and grow profitable customer relationships from the very first contact. Many companies are missing revenue goals because marketing and sales don't pull together and work as a unified team. Now, you can meet today's challenges with an integrated marketing and sales system that makes it easy for your team to work together from anywhere in the world to meet each customer's individual needs for information, products, and services. Capture leads from offline and online marketing communications, nurture leads with ongoing campaigns, and distribute leads to salespeople and channel partners. Track contact and sales opportunity information with a hosted sales automation module that taps into the marketing profile data salespeople need to turn prospects into loyal, long-term customers. Create dynamic Web content and personalize your information for each visitor with a search engine friendly content management system (CMS). Create online product catalogs for consumer, B-to-B, and partner sales channels — plus order-entry for offline sales and inventory management. Target your audience and tailor your e-mail marketing to provide the continuing contact needed to create top of mind awareness and pull prospects back to your Web site. By starting with one module in the Coravue Connect hosted CRM system and growing into others, you are able to achieve realistic customer relationship management objectives very quickly. And, since Coravue Connect was designed to be a 100% customizable CRM service, it's quicker to implement and more affordable than other hosted customer relationship management products. This helps your marketing and sales team pull together — from anywhere in the world — to help customers benefit from your products and services — which helps you generate more profitable revenue, increase market share, and maximize market leadership.